The cactus pear is the fruit of the prickly pear cactus (the opuntia cactus). When in season, this cactus bears flowers that ripen into the cactus pears. Originally native to the tropical Americas, it is now grown around the world. The cactus pear has a skin that can be green, yellow, orange, pink, or red. The pulp contains many edible seeds, and it is sweet and juicy, like a mild-flavoured watermelon. 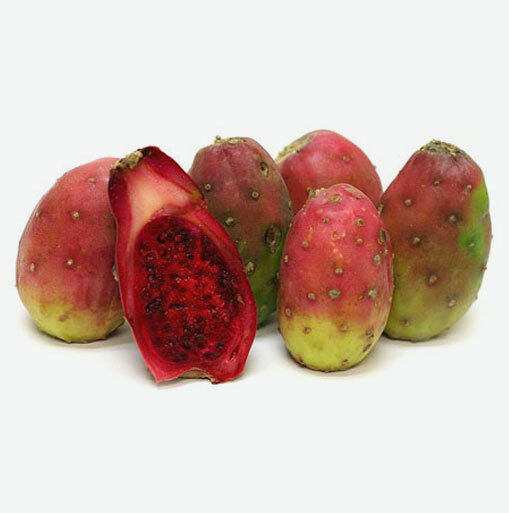 Cactus pears are low in saturated fat and they are very low in cholesterol and sodium. These fruit are a good source of calcium, which helps maintain strong bones and connective tissue. They are also a good source of potassium, which helps to regulate blood pressure, and they are a very good source of dietary fiber, vitamin C and magnesium. Choose cactus pears with firm, unblemished skin. They can be ripened at room temperature until they are soft and uniform in colour (ripe pears should be refrigerated). Cactus pears sold in stores will already have their main spines removed; however, they are still covered in tiny barbed hairs that can be irritating to the skin. To prepare, cut the top off thinly at each end of the pear, then use your fingers or a fork to peel the rest of the skin completely. Cactus pears can be eaten fresh, added to salads, mixed into drinks, made into jellies, and even made into sorbets. Before cooking cactus pears (for example, in the making of jellies or chutneys), pass the pulp through a sieve to remove the seeds, which harden when cooked. Try adding sliced or cubed fruit to omelettes for a tasty treat.